It's spring break in my world, and like always during this week, it looks like spring from my window and feels like winter as soon as I walk out the door. But, we do have sunshine, and I slept late. So no complaining about the temperature from me! I've been looking for and collecting milk glass for a few years, and today I thought I would show you one way I've been pulling it out of my cabinet and actually using and enjoying it. 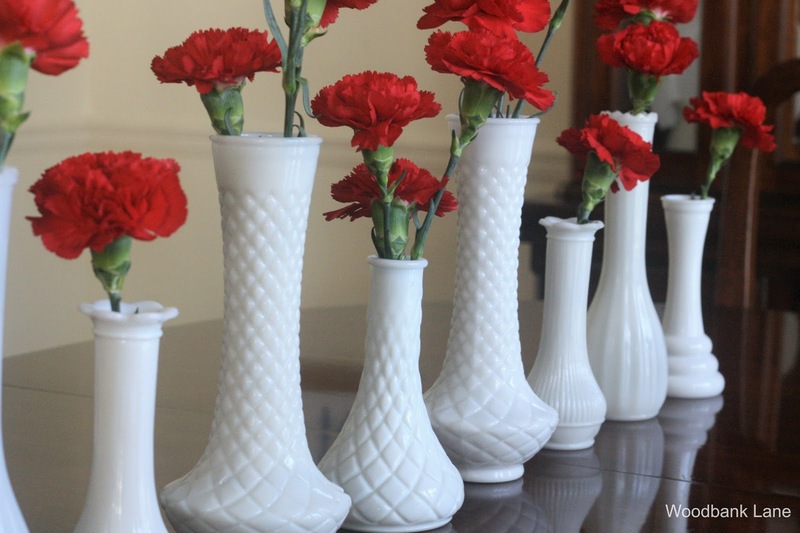 I have nine vases--four sets that match and one odd ball. I almost never find them in a thrift store as a pair. But, I don't mind. Hunting and digging is part of the fun in collecting, at least for me. As you can see, each set has its own pattern. Lines, diamonds, or smooth ripples. The tops are different on each vase as well and add to the character of the pieces. 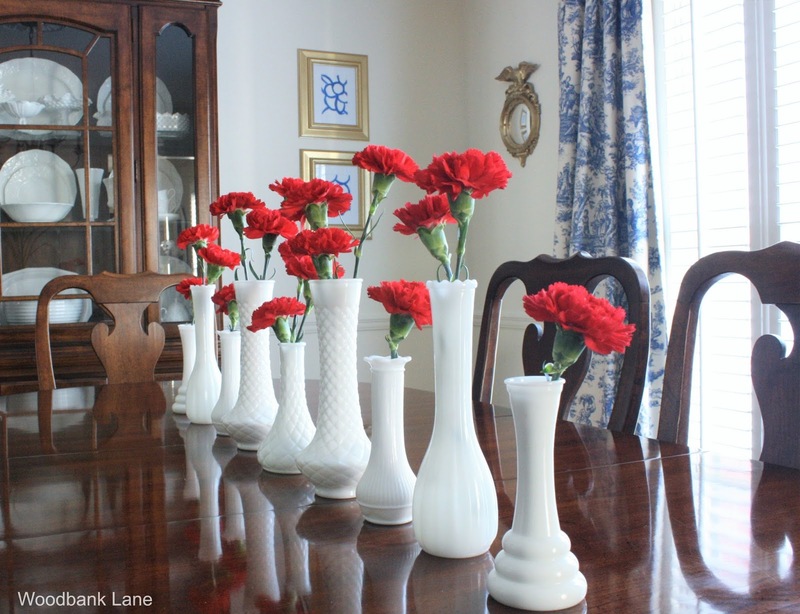 For this display, I simply lined the center of the dining room table with the vases and dropped in carnations from my local grocery store. It really is so simple, but they make a stunning display. I can usually get almost two weeks out of the flowers. We celebrated our daughter's birthday at the beginning of the month and as you can see, the carnations are still going strong. I used them one other time recently, bunched together on an antique tray. At the time, I had only come across seven of them. I'm constantly on the look out for different pieces of milk glass. I have several of the hobnail vases and bowls. They're great to pull out for the holidays and special occasions. The white color looks good mixed in with every day vignettes too, and it also looks pretty on book shelves. 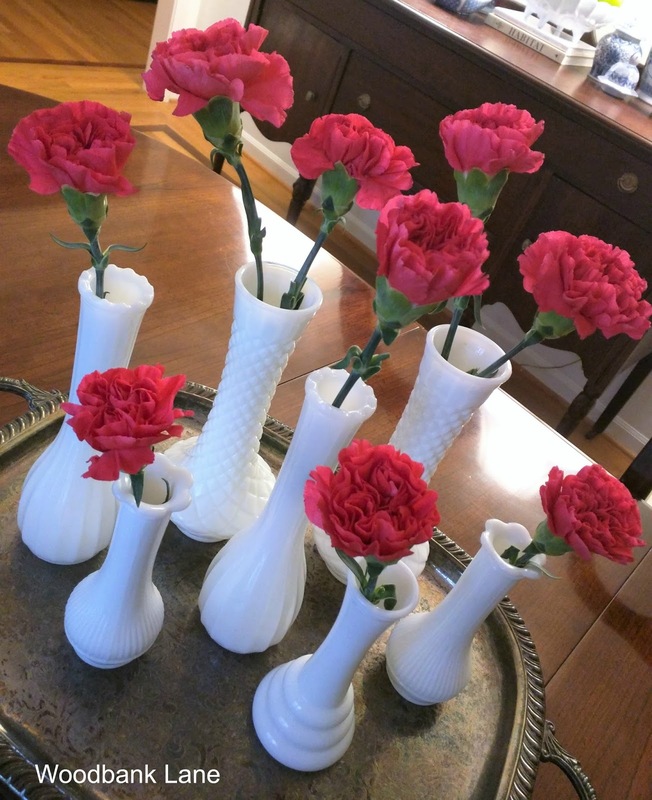 A couple of weeks ago in my Friday's Five post, I shared this article with some other good ideas for using milk glass. Do you have a favorite thing to collect? I have a few random pieces of milk glass that I inherited. You’ve inspired me do dig them out and make use of them. Thanks! These are so pretty Kathryn! I see these vases every now and again when I am thrifting and am going to start buying them to start a collection. I love how they look down the center of your table! Thank you for the wonderful idea! Thanks so much, Stacey! No, I haven't seen her. Going to check her out right now! Thanks for the tip.